The Gambia's concern for the environment and in particular conservation dated back to the 1977 Banjul Declaration, a special statement setting out the country's commitment to conservation. It reflected on the disappearing of wildlife spieces as well as the conservation of the remaining fauna and flora from further destruction. In April 1994, indigenous Gambian youths concerned with the preservation of the country's flora and fauna also formed West African Bird Study Association (WABSA). This site is intended to provide the reader with an overview of the six parks and reserves in the country as well as giving information on habitat types, fauna and avi-fauna found in The Gambia and also a brief information on WABSA. 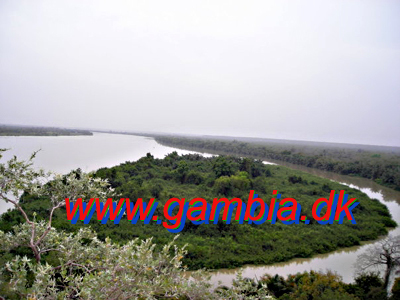 The first protected area to be established in The Gambia was Abuko Nature Reserve, which was gazetted in 1968. This prompted the government to set up a Wildlife Conservation Unit under the auspices of the Office of the President, to it weight and recognition. This action demonstrated The Gambias commitment to wildlife conservation and management. Since then, a further 5 areas around the country have been gazetted as protected areas due to the unique or endangered nature of the biodiversity they contain. The increasing human population, coupled with agricultural production practices which do not take into account conservation, have led to the loss of a large proportion of The Gambias forest cover together with many of our wildlife species. For this reason, the government has taken initiatives over the years to designate certain areas with protected status. To date, protected areas comprise more than 3% of the total area of The Gambia. The latest wildlife policy aims at increasing this to 5% with a proportional regional distribution. The parks and reserves of The Gambia have been specially chosen for the endangered nature of the habitat type and/or species found within them. The intention is to provide a safe haven for flora and fauna to flourish without undue interference from man. A limited range of resource utilisation by local communities is permitted provided this is compatible with the aims and objectives of the protected areas concerned. * limits on the types of animals that may be hunted without licence (vermin only) and strict control of hunting licences and methods of hunting. * prohibition of the sale of wild animals or parts of wild animals alive or dead, the only exception being warthog, Gambian giant rat and other other pests as described in the act. * strict control on the import and export of wild animals. The Gambia has very strict laws regarding the sale of animals and their by-products. Despite this law a clandestine trade in animal products does exist. However wildlife officers make periodic unannounced raids on tourist facilities and local markets in an effort to curb this practice. Visitors to The Gambia should bear in mind the stringency of the laws regarding animal products. To avoid any misunderstandings it is best to simply now purchase animal products. If you are offered goods for sale which you feel may be in contravention of the law, please report the matter either directly to the Department of Parks & Wildlife Management or to the nearest police station. The keeping of wild animals in captivity is also against the law. This includes all species of monkeys, parrot and other birds which are the animals most frequently found in captivity. The law however pertains to all species of wild animals. As well as animals being kept as "pets", tourist businesses often use these creatures as attractions for visitors. Many of these animals are kept in inhumane conditions, usually as a result of ignorance on the part of their "owner" as to how to care for a wild animal. The Department of Parks & Wildlife Management operates ongoing investigations into reports of animals illegally held in captivity. The result is almost always confiscation of the animal and can result in prosecution for those responsible. Confiscated animals are then brought to the animal orphanage at Abuko Nature Reserve until they are deemed fit to be reintroduced into the wild. Again, if you see any activity pertaining to wild animals you feel may contravene the strict protection laws, please contact a wildlife officer or report the matter to the police. The parks and reserves of The Gambia offer the visitor a rich and unique experience, with something to suit every taste. The wide diversity of fauna, habitat types, flora and the opportunity to view wildlife in its natural environment attracts much interest both locally and internationally. In order to maximise the enjoyment and safety for visitors both now and in the future we would ask that the following rules and regulations are abided by. Removal of any item - plant or animal, living or dead - is strictly forbidden. Non-commercial photography and video filming is permitted and does not require special permission but permission must be sought for any filming that is to be used commercially. Please take care not to leave any litter or other physical evidence of your visit. The lighting of fires is strictly prohibited in protected areas. If you smoke please ensure all matches and cigarettes are carefully extinguished. Please observe no-smoking signs. In order to maximise the value of your visit and that of other visitors please refrain from making unnecessary noise. This will reduce your chances of seeing animals and birds. The playing of radios and cassette players is not allowed inside any protected area. Hopefully you will have plenty of opportunities to view creatures in their natural environment. Please bear in mind that this is their home, do not interfere in anyway with nests or other habitats or scare/intimidate any wild animal. * Never stray from the footpath. * Do not feed any animal, no matter how friendly it seems it is still wild. * Do not approach a sick or injured animal. Report you finding to protected area staff as soon as possible. * Make sure you wear appropriate clothing and footwear. * Do not climb in trees or swing from lianas. As well as been dangerous, this can result in damage to the plant and also may lead to an encounter with an arboreal green mamba. * Parks and reserves may be visited from 8am-6pm daily unless express permission is given to visit outside these hours. Many people visiting the protected areas of The Gambia do so in the hope of spotting some birds or animals in their natural habitats. The following is a list of simple techniques which may help to improve the quality of your visit. * Timing - both the time of the day and the time of year you visit have a big impact on your prospects for viewing wildlife. Early morning and late afternoon/evening are generally the best times of day, as most animals and birds take shelter from the sun during the hottest part of the day. The best season to visit will very much depend on what you want to see. Animals and birds are more easily spotted at the end of the dry season (February-May) when vegetation is thinnest. However those interested in flora will appreciate the end of the rainy season (August-October) when the wide variety of native trees and plants are at their best. If you are interested in a specific species make sure to investigate when you are most likely to see them. For example, crocodiles are most easily seen at the coldest time of the year (December & January) when they leave the cool water to bask in the morning sunshine. Nocturnal visits to protected areas may be facilitated for interested parties. * Behaviour - Animals in protected areas are habituated to humans and are not unduly threatened by them. However, if you act in an unnatural way, for example, creeping very quietly and speaking in low whispers, they may be alarmed by this behaviour. Similarly, undue loud noises and abrupt movements may have the same effect. When speaking, do so in a low, normal tone. If you spot an animal, do not try to get very close but rather remain still and appear as though your attention is directed elsewhere. This will often result in the animal continuing its activity without becoming disturbed by your presence. * Positioning - One way of increasing your chances of viewing wildlife is to learn a little about their habits. Park staff and local people are often the best sources of information on indigenous species. Positioning yourself a short distance away from a tree where the animal is know to feed or a favoured watering hole will often yield interesting results. Make use of viewing areas and photo hides within the protected area. These are purposely positioned near areas where the animal are known to be frequent. * Equipment - You can have a very satisfying day viewing wildlife without the need for any technical equipment. However, a good pair of binoculars will prove useful. Apart from that, ensuring your own personal comfort will improve the quality of your visit greatly. Make sure to bring plenty of bottled water and some food, particularly if you plan on spending a few hours in the park or reserve. (Cold drinks, coffee, tea and snacks may be purchased at Abuko Nature Reserve and Kiang West National Park). Ensure you are adequately protected from the sun by using sun block and always keeping your head covered. Wear clothes that cover arms and legs, and boots and socks to protect from insects. You may also find an insect repellent useful. * Use of Senses - Many animals will be first located by hearing (hence the value of keeping noise levels to a minimum). Animals rely heavily on scent to detect prey and predators, so it is worthwhile (where feasible) to walk upwind. Use your eyes also. The signs animalsleave can tell you many things and are best looked for in soft mud, wet sand etc. Note : Please feel free to report your comments, suggestions or interesting/unusual findings to any of the park staff.